This entry had two special features that caught the judges eyes--the first was the burnt edge of the illustration. 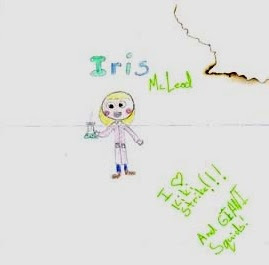 Signifying Iris's clumsiness, perhaps? Also, the envelope in which the entry arrived featured A GIANT SQUID!!! ??? It goes straight from special prize #2 to Finalist #5!!! Explaination please??? Slovakia girl: Scroll down. Remember, the entries are in reverse chronological order. YAY!!! ^^ A giant squid! So cute! And GIANT SQUID!